Double vanity units are a real luxury because they ooze style and practicality. More suited to medium and larger bathrooms, these elegant pieces of bathroom furniture feature a double basin design which are commonly referred to as his and hers basins; perfect for couples to use in sync! 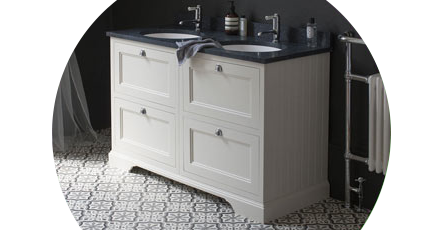 Finding the perfect style of double vanity unit is easy. Simply choose between a modern and traditional design; then decide whether you'd like a wall hung or freestanding unit. There lots of double sink vanity units to choose from so using this filter method will narrow the options making it much easier to pick the perfect one. As well as twin basins, a double vanity unit will provide you with double the space of an ordinary unit. As this is combined in one piece of luxurious bathroom furniture it means that a double basin vanity unit won't take up as much space as two separates.